Cash Mob to Strike NELA! While council member Gil Cedillo works hard to keep North Figueroa safe for cut-through speeders, LADOT is working to support the local businesses that make NELA’s neighborhood culture possible. After all, no one here wants to live out their lives as anonymous blurs decorating the blank gray shoulders of a faux freeway. North Figueroa isn’t a corridor; it’s a community—something Cedillo and his puppet masters are incapable of comprehending. LADOT, which used to be a mountain of incomprehension itself, seems to have grown up. Thye are ready to go with the Figueroa Complete Streets treatment that Cedillo so steadfastly opposes. As a friend of mine who is on the Arroyo Seco Neighborhood Council noted, why would Cedillo want to begin a whole other round of “studies” of a Marmion Way bike route, leading nowhere, when North Fig has been studied, vetted, discussed, designed, and funded, and is ready to go? Probably just to waste city dollars and everybody’s time. Meanwhile, LADOT is sponsoring a Cash Mob Ride of sorts, to open neighbors’ eyes to the pleasures and possibilities of shopping by bike, and to enlighten local merchants ot the well-proven profitability of reshaping streets to entice more biking. Yes, a few of our retailers remain trammeled by the baseless clichés that undergird the dwindling prejudices against practical cycling. And so the LADOT’s Northeast LA Bicycle Friendly Business District Announces a Holiday Shopping Ride: Shop – Ride – Nela for December 13th! LADOT is a proud partner in the Northeast LA Bicycle Friendly Business District (NELA BFBD) kickoff event: SHOP – RIDE – NELA Holiday Edition. The bicycle ride, led by C.I.C.L.E., will take place on Saturday December 13th, from 9:30am-12:30pm, and traverse 3.6 miles of Northeast LA’s most vibrant shopping corridors. The ride will meet at METRO’s Highland Park Gold Line Station and make shopping and dining stops at LADOT’s two local business-sponsored Bicycle Corrals: the York Boulevard Corral located at 5000 York Boulevard (sponsored by Cafe de Leche) and the Colorado Boulevard Corral soon to be installed at 2136 Colorado Boulevard (sponsored by Core Club). Riders of all ages and abilities are encouraged to join this leisurely ride! The event has been spearheaded by the NELA BFBD Steering Committee of local stakeholders and represents a collaboration and partnership between businesses, the community, and the LADOT Bicycle Program. The primary goal of the partnership is to bring more people to local businesses by bicycle. The NELA BFBD does this by implementing bicycle infrastructure enhancements to the neighborhood like bike lanes, corrals, and repair stations; offering promotional incentives to people arriving by bicycle; and overall, encouraging customers and employees to take local trips to business corridors on bicycles rather than in cars. 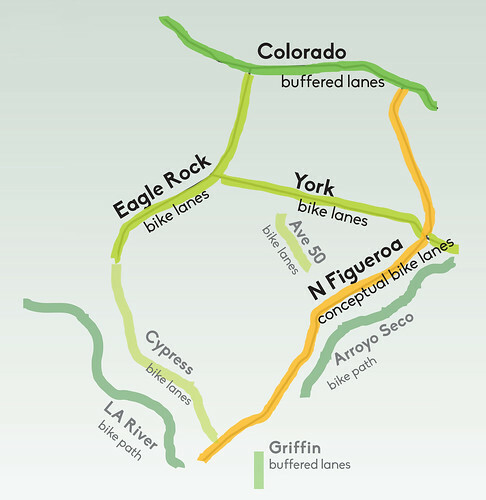 The NELA BFBD is the first pilot BFBD in Los Angeles and includes Colorado Boulevard, York Boulevard, N. Figueroa Street, and Eagle Rock Boulevard. Councilmember Jose Huizar has been a great supporter of people walking and biking to local businesses and this event will showcase the dynamic effect a walkable-bikeable neighborhood can have on invigorating economic activity, especially around the holidays. Ride participants will travel at a casual speed, slowing down to stroll, take in the local scenery, and explore local businesses and culture. Shopping by bicycle enables unlimited parking time, encouraging people on bikes to take their time and discover the amazing offerings within these business corridors. Businesses that offer a shopping discount to ride participants and others arriving by bicycle on the day of the ride or through the Bicycle Friendly Business Program will be listed in a map distributed to riders. For more information about the event, email elizabeth.gallardo@lacity.org. To learn more about Bicycle Friendly Business, or to opt in to the Bicycle Friendly Business Program, click here. Events like SHOP – RIDE – NELA would not be possible without those who have helped plan, sponsor, and facilitate the program. Special thanks to Cafe De Leche, Core Club LA, Big Mama and Papa’s Pizzeria, Councilmember Jose Huizar and Council District 14 staff, C.I.C.L.E., Eagle Rock Neighborhood Council, Occidental College Urban and Environmental Policy Institute, and the Los Angeles County Bicycle Coalition.